An unabashedly savory collage of french-fried potatoes, beef gravy, and squeaky-fresh cheese curds, poutine is perhaps the ultimate late-night snack. The province's gastronomic achievements may reach dizzying heights, but Quebec may forever be known as the place where poutine began. An unabashedly savory collage of french-fried potatoes, beef gravy, and squeaky-fresh cheese curds, poutine is perhaps the ultimate late-night snack. 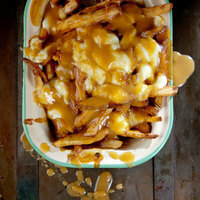 This gravy fry, poutine recipe comes to us from Toronto, Ontario native and kitchen assistant Anne-Marie White. An unabashedly savory collage of french-fried potatoes, beef gravy, and squeaky-fresh cheese curds, it's perhaps the ultimate late-night snack. Cut potatoes into lengths of about 1⁄4" x 1⁄4" x 4". Place in a large bowl, cover with cold water, and refrigerate for about 2 hours.